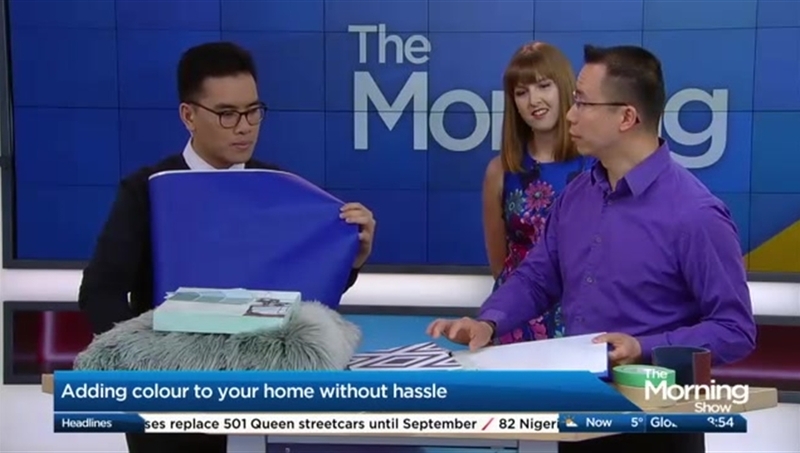 Peacock Living was featured on Global's Morning Show, with host Liem Vu. The segment was about "How to add a pop of colour to your home". We had Samantha Grieve, an Interior Decorator discussing how to choose colour, and where to find inspiration. Leroy Lo from Peacock Living, demonstrating how SurfaceMotif simplifies your paint projects, and its design possibilities. And Craig Armstrong, a professional painter discussing how to prepare surfaces, and how to select the right masking tape for the job. We were featured on Cityline on Home Day. Sharon Grech, Colour and Decor Expert from Benjamin Moore, discusses the importance of colour and pattern, when designing a space. Introducing SurfaceMotif as a new way to add that colour and style to a room. Illustrating some of the different design possibilities that can be achieved. In the 2nd Segment of Cityline, Sharon explains how SurfaceMotif is an alternative to traditional masking tape. Demonstrating how patterns are easily created without the need to measure or cut. A versatile product that can be applied to different surfaces and materials. An exhibitor at the 2017 Interior Design Show (IDS17). Our booth showcased the versatility and customizability of SurfaceMotif. The center 3 decorative drywall panels used the same stencil design, the Diagonal Motif, to achieve the contrasting painted finishes. The Vertical Motif and Diagonal Motif were applied onto wooden panels, creating wall art for the right wall. An IKEA Lisabo side table was also personalized using the Diagonal Motif. Received a mention from Melissa Davis at the National Home Show. An exciting new and innovative decorating product. An alternative to wallpaper, to create colourful patterns and designs for your walls. The bedroom we painted in the Reno and Decor booth for Rebecca Hay Designs. In line with the nautical inspired theme, we painted this buffalo check pattern to give a cottage feel. Painted single coats of horizontal and vertical stripes, created the different tones. The result, is the look of a textured wallpaper. For questions and comments, please contact us at info@peacockliving.com. 2019 © Peacock Living Inc.